Description: Shimmering lace motifs waltz over allover lace in this romantic sheath wedding dress, comprised of tulle. 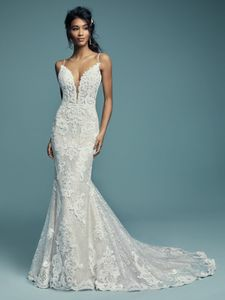 Beaded spaghetti straps glide from the sheer bodice and illusion plunging sweetheart neckline to sheer back, also layered with lace motifs and allover lace. Finished with covered buttons over zipper closure. *This offer is only valid with the purchase of a wedding gown. Simply add your favorite veil to your shopping cart and we will deduct the amount from your total once your order is processed. If the value of the chosen veil is more than $50.00, then this amount will be deducted from the price of the veil. If the value of the chosen shoes is more than $50.00, then this amount will be deducted from the price of the shoes. If the value is less than this amount, the difference will not be credited to the customer. Veil and shoe order must be placed at the same time as the gown purchase to receive offer.